The Launch 5 is an Emerson designed automatic that delivers his personal style and in-hand performance. Handle features, like the deep index finger groove and notched thumb ramp, contribute to safely utilizing this stellar knife. The clip point blade is stonewashed and made to tackle just about any chore you'd encounter. 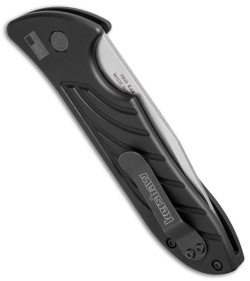 This Launch model sports an integrated back spacer and, in addition to the lanyard tie-off, has a reversible tip-up carry pocket clip. I have not had it long, but so far it deploys perfectly and locks up solid every time. Just everything about it impresses me. Fit and finish are top notch. The wing design on the sides looks good and feels good....adds a little grippy. Previous review said the button is flush.....I find it is a tad bit above the side, and my finger finds it easily. I would prefer it to be maybe a mm taller, but it's not bad. Has become one of my favorite folders. My wife replaced my Launch 2, with this one as a birthday present. It's the best one I've ever had, it's BadAss!!! 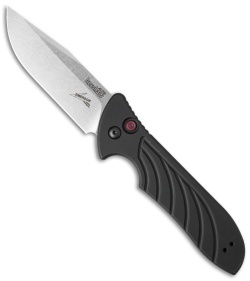 Emerson design is cool, raven wings on the handles, are you kidding me? Awesome knife man! If you love autos like me you will be so impressed, quality is top notch, I carry it everywhere. If you're needing an automatic you can't do better for your money, buy it bro. Received my Emerson Launch 5 last week and initially was very impressed. But within 24 hours it had become 80% functional. It will not open correctly but 4 out of 5 times. Like a gun, when you pull the trigger something has to happen, the same with an automatic, it has to open fully and be locked. I love the look, balance and overall feel of this knife and I think overall for hard use day in day out CPM 154 is hard to beat, but the knife has to function 100%. Read my review and I was a little harsh. I traded for a switchblade in 1957 in the second grade and have had many switchblades, otf, and coil spring automatics since. As and edc an automatic will never be 100% or at least I have never had one. I have a Hogue 4" auto that is close but it gets a little dirty and doesn't open every now and then. I guess I wanted this knife to be perfect because it was the size I like and the blade steel I like and has an aluminum handle. I am skewed toward aluminum because of the insensitive way they show wear as the coating wears off. I have tinkered with the fit up and tensions on this knife and have it working pretty good. Thanks for your response and like I said maybe I just got the "one" that wasn't perfect. I now have played with this setup and do almost have it 100%. Also have the knife as sharp as a single edge razor so it is climbing the ladder of favorites. 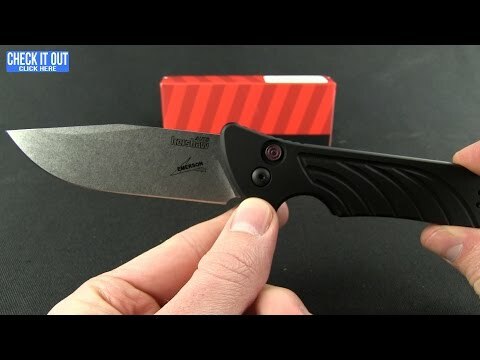 This knife is by far the best build on the Kershaw Launch series. Emerson designs are typically not lacking in quality. knife deploys and locks up fast and is very balanced in the hand. 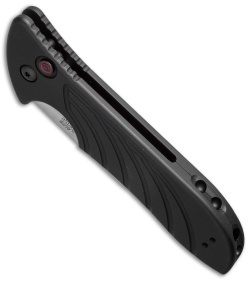 Between the jimping on the rear ramp and the DEEP index relief this knife is very easy to hold on to. I don't think you have to worry about biting the blade on this one. The milling and texture on the aluminum scales give this knife a comfortable grip even in wet hands. Large stonewashed blade is extremely sharp out of the box and has a great shape to it. The only real Con that I can find with this particular knife is that the button is completely flush with the scale and it can make it difficult to locate in a gloved hand or in general. It could definitely use some more tactile feel to it. Although with no "alternative safety" I suppose that you must have some sort of resistance to avoid pocket deployment. Overall wonderful knife from Kershaw and WELL worth the asking price considering other comparable knives are much closer to the $200 mark.